Very beautiful work done in oil on wood panel treated trompe lil and dating from the nineteenth century and signed l. Very nice bill for this work in good condition (the varnish may be to resume, a crack in the panel but very visible from the front - see photos). Note that the picture is sold with its frame with brass cartridge but the whole frame is particularly heavy (almost 7 kg) and therefore fragile. The frame will require some minimal restorations (see photos). I can send the work without the frame to avoid any risk of breakage: then count 200 euros, delivery included for the panel alone (without frame but with the brass cartridge) - thank you, in this case, to contact me in advance Panel size: 26/50 cm, with frame: 52/75 cm. The shipping price includes the cost of transportation as well as the cost of supplies necessary for the protection of the work. The subscription of a delivery insurance. Remains the only remedy available in case of loss, theft or damage during the expedition. It remains your choice and your responsibility. For a purchase from abroad. Thanking you in advance for your trust. 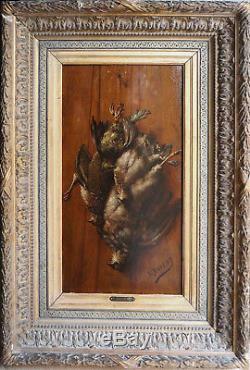 The item "painting hsp xix ° trompe l'oeil animal signed l. Duveny with frame + cartouche" is on sale since Sunday, December 31, 2017.